A kite is an unpowered, heavier-than-air flying device held to the earth by a line. The kite flies because wind resistance causes the air pressure under the kite to be greater than the air pressure above the kite, making the kite rise. The word kite is derived from the name of a type of bird belonging to the hawk family which is know for its graceful, soaring flight. A kite consists of three basic parts: the body, the line, and the bridle that attaches the line to the body. To enable the user to control the movement of the kite, the bridle must be attached to the body of the kite in at least two places. Kites were first developed in ancient China. Written references to kites in China date back to 200 B.C. , but they were probably invented at a much earlier time. Kites were probably derived from cloth banners, similar to modern flags, which streamed out in the wind while attached to cords or flexible wooden rods. The first use for kites was probably for signaling at a distance. The Chinese later used kites for numerous purposes, ranging from religious ceremonies to warfare. The earliest kites were built of wood and cloth. Paper was invented around the year 100 A.D. and was soon adapted for use in kites. Kitemaking soon spread from China to Japan, Korea, Burma (now, Myanmar), and Malaysia, regions where kite flying is still an important part of the local culture. From there it spread to Indonesia, India, and the islands of the Pacific. Eventually, the kitemaking technology was adapted by the Arabs, who in turn brought it to North Africa and Europe. Written references to kitemaking in Europe date back to 1430 A.D. Early European kites were made of cloth or parchment and sometimes had a long slit with a piece of silk sewn into it to help the kite soar. A pair of diagonal sticks were attached to the cloth to hold it in place. A cord was attached to the kite by a ring sewn into the cloth. The first description of kitemaking in English appeared in 1654 in a book by John Bate entitled Mysteries of Nature and Art. His instructions are not unlike the methods still used to make homemade kites today. "You must take a piece of linen cloth of a yard or more in length; it must be cut after the form of a pane of glass; fasten two light sticks cross the same, to make it stand at breadth; then smear it over with linseed oil, and liquid varnish tempered together…then tie a small rope of length sufficient to raise it unto what height you shall desire." European kites existed in a variety of shapes, ranging from lozenges to rectangles. They all required tails for stability, and many homemade kites still have such tails. Commercial kites are usually made in such a way that no tail is required. Kites were used in meteorology as early as the eighteenth century, when two students at the University of Glasgow named Alexander Wilson and Thomas Melville attached thermometers to kites to study the temperature of the air. Kites were used extensively for studying the weather in the 1830s and 1840s, and continued to be used for this purpose until the middle of the twentieth century, when they were replaced by weather balloons and later by weather satellites. Innovations in kite design began to appear in the late nineteenth century. In 1891, William A. Eddy, inspired by a Japanese design, invented a diamond-shaped kite, which did not need a tail. In 1893, Lawrence Hargrave invented the box kite, resembling two or more open-ended boxes connected to a wooden frame. Like the diamond kite, the box kite flew well without a tail. Both designs are still commonly used by kitemakers today. The box kite also influenced the design of early aircraft, including the airplane invented by Orville and Wilbur Wright in 1903. In November 1948, Gertrude and Francis Rogallo applied for a patent on a revolutionary new kind of kite. The patent was issued in March 1951, for the "flexible kite," now usually known as a para-wing. This seemingly simple kite consists of a square of light material (cloth at first, now usually plastic) without any sticks or other parts to hold it in place. Proper length and placement of the cords which make up the bridle enable the para-wing to fly with great stability despite the limpness of its body. Designs similar to the para-wing have been used in parachutes and hang gliders. Military experiments have shown that large versions of this design could be used to carry weapons or vehicles over otherwise impassable terrain. A 4,000 sq ft (372 sq m) para-wing has been used to lift a load of 6,000 lb (2,724 kg). Homemade kites are usually made of wood and paper or cloth. Homemade para-wing kites are usually made of Mylar, a trade-name for thin sheets of a plastic known as polyethylene terephthalate. This material is extremely strong and very light. The raw materials used to make polyethylene terephthalate are the chemical compounds glycol and dimethyl terephthalate. Commercial kites are generally made of a strong, light plastic such as nylon. Nylon is the common name for certain types of plastic known as polyamides. Polyamides can be made from a variety of chemical compounds. Nylon-6,6 is the most common form of nylon and is made from the chemical compounds adipic acid and hexamthylenediamine. Another common type of nylon is known as nylon-6 and is made from the chemical compound caprolactam. The lines attached to the body of the kite are usually made of nylon or cotton. For some large kites, the line is held on a fishing reel, which is made of steel. 1 The chemicals used to manufacture the various forms of nylon are obtained from a variety of sources. The most common source for these chemicals is petroleum. Crude oil (unprocessed petroleum) is obtained from oil wells. Crude oil contains a mixture of many different substances known as hydrocarbons. The crude oil is pumped into tanks carried by trucks or trains and shipped to refineries. 2 The function of a refinery is to separate crude oil into its various components. During this process known as fractional distillation, the crude oil is pumped into a tall steel furnace shaped like a cylinder. The furnace is heated at the bottom to a temperature between 600-700° F (315-370° C). The heated crude oil boils into a vapor. Any remaining unvaporized residue is removed from the bottom of the furnace as a liquid. 3 As the vapor rises through the furnace, it slowly becomes cooler and cooler. The different hydrocarbons that make up the vapor cool into liquids at different temperatures. Because of this difference in boiling points, each hydrocarbon can be removed as a liquid from a different position within the furnace. Any remaining vapor that does not cool into a liquid is removed from the top of the furnace as a gas. 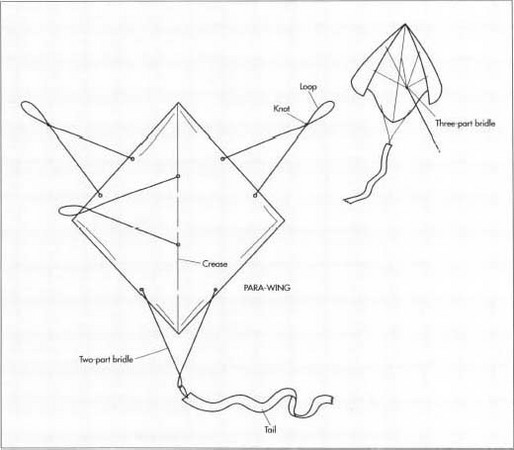 The para-wing kite is a seemingly simple kite, consisting of a square of light material (cloth at first, now usually plastic) without any sticks or other parts to hold it in place. Proper length and placement of the cords which make up the bridle enable the para-wing to fly with great stability despite the limpness of its body. hydrocarbons to a very high temperature under very high pressure. Modern cracking technology makes use of catalysts. A catalyst is a substance that speeds up the rate of a chemical reaction without taking part in it. Catalysts such as natural and artificial clays enable cracking to take place at a much lower temperature and pressure. After cracking is completed, the result is a mixture of various hydrocarbons. These hydro-carbons are separated by once again applying the technique of fractional distillation. 5 Hydrocarbons are shipped from the refinery to the plastics manufacturer. The hydrocarbon needed to manufacture nylon-6,6 is known as cyclohexane. Cyclohexane is converted into both adipic acid and hexamethylenediamine by subjecting it to a variety of chemical reactions. 6 Adipic acid and hexamethylenediamine (or other chemical compounds needed to produce other forms of nylon) are transformed into nylon-6,6 through a process known as polymerization. This term refers to any process by which hundreds or thousands of small molecules are linked together to form a long chain. Polymerizaiton of nylon combines numerous molecules of an organic acid (such as adipic acid) with numerous molecules of an organic amine (such as hexamethylenediamine). For some kinds of nylon, numerous molecules of a single chemical, which contains both an acid group and an amine group, are polymerized. This type of chemical (such as caprolactam, which is polymerized into nylon-6) is known as an amino acid. Polymerization occurs by subjecting the acid and the amine or the amino acid to heat and pressure. 7 The resulting hot liquid nylon is sprayed onto a cool rotating metal drum. This transforms the nylon into a thin, solid sheet. The sheet is cut by sharp metal knives into small chips. The chips can then be processed into many different forms. 8 For some purposes, nylon can be extruded (forced through dies under pressure) or subjected to injection molding (forced into molds as a hot liquid and allowed to cool into a solid). In order to make a kite, nylon must be transformed into fabric. Chips of solid nylon are heated until they melt into a liquid. The liquid nylon is then forced under high pressure through numerous small holes in a steel device known as a spinneret. As the jets of liquid nylon emerge from the spinneret, they are cooled by a blast of cold air. The liquid nylons cool into thin filaments. These filaments are twisted together into fiber. The fiber is woven into fabric and shipped to the kite manufacturer. 9 Large pieces of nylon fabric arrive at the kite factory and are inspected for flaws. Sharp knives and razors are used to cut through several layers of nylon at once in order to produce many pieces of fabric which are all the same shape. 10 The cut pieces of nylon fabric are sewn together using ordinary sewing machines. By efficient cutting and sewing, as little as 3% of the fabric is wasted. 11 In order to hold the limp nylon body of the kite in place, the fabric is sewn around a solid rim, which outlines the shape of the kite. This rim is made of light, rigid tubes of polyethylene. These tubes are made by a plastics manufacturer by injection molding. Solid polyethylene is heated until it melts. The hot, liquid polyethylene is forced into molds in the shape of the tubes and allowed to cool into a solid. The molds are opened, the polyethylene tubes are removed, excess polyethylene is trimmed away, and the tubes are shipped to the kite manufacturer. 12 The bridle lines for the kite are cut to the proper length from spools of cotton or nylon fiber. They are then sewn to the body of the kite in the proper places. For large kites, the line is wrapped around a steel fishing reel. The kite industry is the largest user of fishing reels other than the fishing industry itself. The completed kites are packaged in cardboard boxes and shipped to the retailer or consumer. The first step in the quality control of kite manufacturing is inspection of the nylon fabric. It must be free from holes and tears, which would damage the ability of the kite to stay aloft. After it is cut, the fabric is inspected to ensure that all pieces have been cut to the proper size and shape. Experienced sewing machine operators inspect the kite at every step of the sewing process to ensure that every piece is sewn into place properly. The position of the bridle line attachments is particularly critical; if they are not properly placed, the kite will be unstable and will fly erratically. Each kite is given a final visual inspection before it is packaged. Eden, Maxwell. Kiteworks: Exploration in Kite Building and Flying. Sterling Publications, 1989. Hart, Clive. Kites: An Historical Survey. Frederick A. Praeger, 1967. Roberts, Keith. Kiteworld. Arbor House, 1986. Wagenvoord, James. Flying Kites. Macmillan, 1968. Yolen, Jane. World on a String: The Story of Kites. William Collins and World Publishing, 1968.